The crew went ahead and designed 30 days of fun build-it-yourself projects, and through Google+, campers will have access to a talented representative from Make Magazine to help them along the way, while providing plenty of hints and tips. Six virtual field trips will take everyone along to someplace special every Friday, and Maker Camp will top off each week with a special project to hold you over the weekend. This year, each week has its own theme, and Week 1’s “Makers in Motion” theme will be centered around crafting moving inventions, such as a balloon-powered blimp and personally crafted bike accessories. The following weeks will be centered around the exciting: “Create the Future,” “Fun & Games,” “Art & Design,” “DIY Music” and “Make: Believe” themes. Maker Camp is 100% free for everyone, and it’s geared towards inventors and creative folks aged 13 and up. Don’t worry about having to run out to buy extra materials, tool and parts to complete the daily projects, as the Maker Camp team made sure that the majority of them utilize common household items, such as duct tape, pliers and screwdrivers. 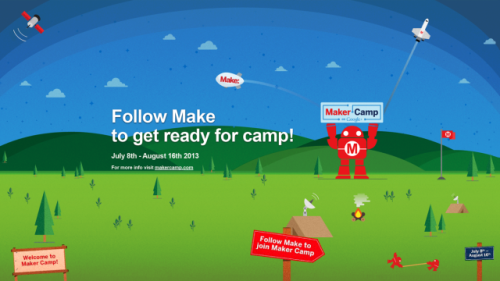 The Google+ Maker Camp 2013 begins July 8th and runs through August 16th, so if you’d like to join this year’s activities from day one, then you’d better click here to sign up! Have fun, campers! If you have any questions, click here for a handy FAQ listing for the Maker Camp event.